A massive haunted house, a non-too-easily-spooked kid call Mickey and a vast horde of mummies, bats & Draculas (yes, plural, 'Draculas'). What more could you ask for? well quite a lot more I suppose, but it's an 8-bit game from 1986 for Geoff’s sake so be happy with what you've got you greedy chimp! 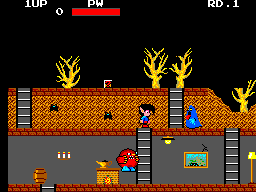 Donning his side scrolling platformer cap the intrepid Mickey must scamper through the dusty corridors of the 'Ghost House' in a bid to get back the five 'precious stones.' Now of course this would be an absolute walk in the park if dust bunnies where the worst thing you had to contend with but, as you know, this particular house is filled with...well according to the booklet everything but ghosts (that blue ghost looking thing is, apparently, death). 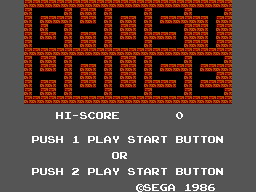 We have a small cast of creepy creatures on show here, and the odd flying arrow whooshing past your big pointy ears, all of which you'll get very accustomed to as you traverse the many, many screens that make up the ghost house. However good old Mickey isn't completely defenseless, in fact he's quite violent for a weird looking ten year old with elf ears. He can punch his way through the denizens of death and grab the odd flying sword straight out of the fetid air, by jumping on it, then shove it straight through the noggin of the nearest nasty. Now, onto those Dracula’s I was on about in the intro: there are five of these bad boys locked up in their cozy coffins throughout the mansion: usually in the toasty basement areas. So it's obvious what you must do from here on out: Grab yourself a key, a flying sword, unlock a coffin and drive some steel through the chest cavity of one of those precious stones hording horrors. Rinse & Repeat this step by step stab-fest four more times and you can eventually make your way into the daylight with your pockets full of preciousness. Everything is bold enough not to get lost in the throng. The creatures and their surroundings are suitably cartoon-spooky, and the whole affair is perhaps a tad on the basic side at times but it's all very functional and atmospheric with a few nice touches. The animation is smooth and there isn't much to complain about. Not the most gorgeous game on the system, or of the time, but nowhere near being one of the many vomit inducing eyesores that reared their stinky head's through out the 80's. I kind of like the sounds available throughout the house although a few of my friends have found them annoying and repetitive - I guess it's all based on how engrossed in the game you get. So, in conclusion, I’ll just say that it's suitable but nothing outstanding. Just what you'd expect from this kind of affair, jump, stab/punch, move - everything is nice and responsive and works extremely well. There is nothing here to that will hinder you in any way at all. Good all-rounder. This, for me and most of my friends and family, is one of 20 or so master system games that keep dragging me in. It stands up incredibly well compared to most retro games and still offers an enjoyable, yet substantial, challenge. 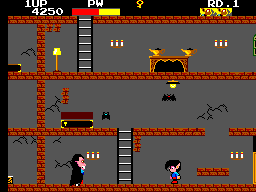 I can't tell you how many times I’ve come back to this game, it's always on in the backround of my yearly halloween parties for people to play, I’ll just say that it has graced the slot of my Master System more than any other of the 50 odd titles I currently own. I'm a big fan of all things spooky and manic miner/jet set willy-esque so this is right up there with my all time favorites. I've had this game for a long time and it still holds my attention with the best of my collection. Highly recommended if you fancy a nice slice of spooky, adventure-lite, arcade action. Grab it now because it's sure to grab you.